With pollsters split on the Illinois governor's race, it's important to remember how regional turnout can move election results fairly dramatically in the Land of Lincoln. custodia a libro samsung a 5 2017 To illustrate that point, we developed an online turnout effect calculator to allow those who possess both political tendencies and way too much time on their hands a chance to play the with different turnout scenarios. The calculator splits Illinois into four regions (Chicago, Suburban Cook Co., Collar Counties and Downstate) and we preset the turnout in each of those areas to match the 2010 midterm turnout. Of course, you can change those anyway you want. 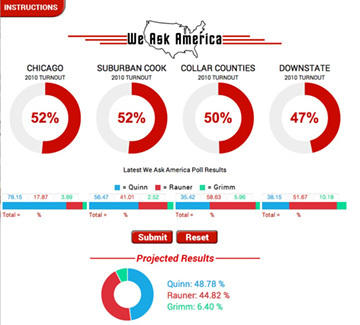 We've also populated the vote splits with our latest poll results, but you can wipe that out and put your own numbers. custodia samsung tab a 2017 After you twiddle the numbers, click the submit button to see what it does to the final results. custodia galaxy s7 portafoglio calcio The whole thing is designed to fit on an iPad, and we included a RESET button to put all the numbers back to presets. custodia samsung j5 2017 oro With the Illinois governor's race as tight as it seems, this shows how tweaking a few numbers effects the final result. galaxy j3 2017 custodia Instructions are on the page (just click on the INSTRUCTIONS button).